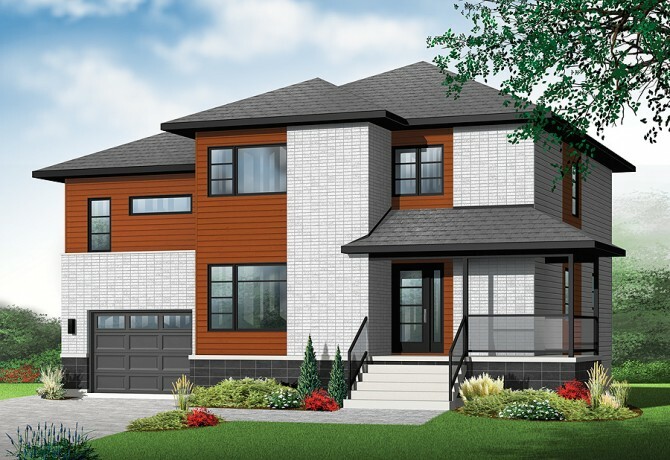 This contemporary cottage is derived from the popular plan 3875, and includes four bedrooms and upstairs family room with additional space above the garage that allows the owners to build another bedroom or even a multi-media room or home office – a bright and pleasing alternative to basement placement of a second family space. On the ground floor, a spacious vestibule and generous closet says ‘welcome’ to all who arrive. The open floor plan provides flexibility in the main activities areas overlooking the rear of the house. The kitchen features plenty of storage opportunities, and expansive lunch island. Looking for a 4 bedroom 2+ bathroom house? Look here!